Today Dave Ohm is one of the most recognised names in the UK jazz scene. He has worked with Benny Golson, Gregory Porter, Wessel Anderson, Claire Martin and makes regular appearances with the Ronnie Scott’s house band. But his career path hasn’t always been a smooth one. After 25 years in the business Dave has collected a vast amount of experience that he is happy to share, either in his position as a visiting lecturer on the Jazz Degree course at Middlesex University – or in this instance with me. After a four hour(!) interview full of stories, advice and wisdom I was left with the challenging task to pick the ‘best of’ for you to enjoy..
What was your way into the drumming world? Luckily my mum insisted I have piano lessons from the age of five. That lasted a few years and then I tried the violin, which was not a success! It was then I gravitated towards the drums. For my 13th birthday I got a snare drum, a pair of brushes and sticks. I played around on that for a year or so and then got my first drum kit. It was a 1960’s white marine pearl Beverley kit. I loved that kit! I sold it a couple of years ago, turned out the guy who bought it was the drummer for Florence And The Machine, so happily it went to a good home. Anyway, I joined some local bands playing pop and rock stuff. Just having fun with mates, nothing too serious. After school I didn’t formally study music but went on to do a degree in History. I was in a couple of bands in college though and it was around that time that I got into jazz. My dad is a huge jazz fan and had tried to get me into it a few times before. I ignored him(!) but then eventually found the music for myself in the late 80s. The Clint Eastwood film Bird was a big influence on me. When I started going to gigs I realised what all the fuss was about! When did you decide on drumming as a career? I finished my degree and decided to give myself five years as a drummer to see if I could get anywhere. That’s how I started. Not the more structured route that people take today. Back then there was less of an educational infrastructure for jazz, now it’s very different. I started going to Ronnie Scott’s checking out the music and I really just got inspired by watching all these great jazz musicians play live. I also started going down to the 606 Club in Chelsea. I learned how to play jazz by a mixture of listening to records, going to gigs and sitting in and getting roasted. At that time Jeremy Stacey and his guitarist brother Paul pretty much lived in the 606, they played there all the time. There was an open jam culture at the club then so sitting in was encouraged. The standard of music was and still is really high at the 606 and I got to hear some great playing from drummers like Ian Thomas, Winston Clifford, Clark Tracey, Mark Fletcher, Mark Mondesir, Mike Bradley, Bryan Spring and Jeremy of course. It could be brutal sometimes but it was effective. You would go away, practise, come back and try again. I’ve always had a robust stubborn streak. You need one in this business! I grew up as a musician at a time in London (the early 90s) where you could play gigs without being able to play [laughs] – you can’t really do that now. So I got myself a Sunday lunchtime gig on the Edgware Road and asked musicians like pianist Gareth Williams to come along and play. I got to meet players on the scene and started building up contacts. Eventually I got my break in ‘94 with the Steve Melling Trio playing my debut at Ronnie’s backing a really swinging American singer called Deborah Brown. Steve’s trio was a regular support band at Ronnie’s so for the next two or three years I played there a lot. Things really started to take off then. Are there drummers who influenced you a lot when you grew up? I’ve always had very wide listening tastes but one drummer that sticks out is Stewart Copeland with The Police. Looking back, he had a big influence on how I feel time and groove. Also my parents took me to see Buddy Rich as a kid which was an extraordinary experience and very inspiring. I think every drummer I’ve seen has influenced me. Luckily I was around when a lot of jazz drumming’s greats were still alive and coming to London to play at Ronnies. The club had a wonderful policy of cheap entry for Musicians Union members back then. Hearing the likes of Elvin Jones, Art Blakey, Tony Williams and Billy Higgins up close was life changing stuff! The great thing about our instrument is that it’s so visual: you can see the technique, you can see the touch – you can always learn something from watching a drummer. 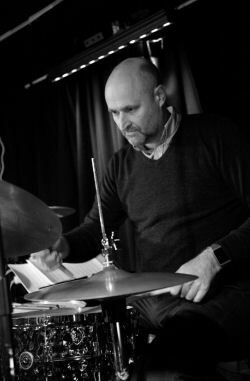 Also a special mention must go to a great drummer and friend Dave Barry, who was very supportive of me in my early career. Dave showed me the ropes and put me on the right path. Do your parents have a musical background as well? No my parents are both actors. My mum loved playing piano and as I said my dad is a big jazz fan. They understand the creative process inside out, the business side of things and have always been great supporters of me over the years. I can go to them for advice and they always know where I’m coming from. That’s invaluable to me. My father, Peter Vaughan, has had an incredible career spanning 77 years. He’s still working at the highest level aged 92. Truly inspiring. You can watch him as Maester Aemon in Game Of Thrones. This year I’m doing three very different projects. Anthony Strong – a singer/pianist I’ve been working with for the last two years. He’s a very talented musician and arranger who is making waves in Europe and beyond. We’ve been doing some really nice gigs around the world going to some very exotic locations. It’s a great experience working with Anthony because his music is very well organised and he knows exactly what he wants. He plays a bit of drums and understands the instrument plus he hears everything! This creates an intense focus and discipline on the gigs which are always high energy and go down a storm. Ian Shaw – Ian is a very well respected British jazz singer and friend I’ve known and worked with a lot over the years. 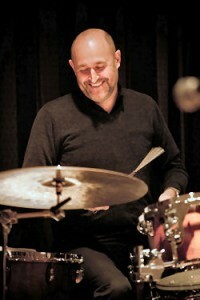 I’m playing in his latest Quartet project with pianist Barry Green and bassist Mick Hutton. He’s an incredible creative artist and singer and it’s always rewarding and challenging working with him because he’s a genuine improvisor who loves to take risks. The third project is with my partner, Georgia Mancio, who is a wonderful singer and lyricist I’ve been working with for the last 14 years. She’s currently writing lyrics for Grammy Award-winning pianist Alan Broadbent. There are some gigs in the UK and an album recording of these original songs later this year. That’s very exciting. Let’s talk about your seat in the house band at Ronnie Scott’s. That’s a bit of a dream gig for every jazz drummer, isn’t it? Absolutely yes! I’m very lucky to be in that loop, part of a small group of drummers who have done that gig over the last few years. I know James Pearson – who’s the MD and a brilliant pianist – from playing with him in Ian Shaw’s band. Ronnie’s is a really important place for me: I’ve had a lot of significant nights there, seen some amazing performances and played opposite some amazing musicians. Do you get to play with a lot of visiting artists there? I’ve played for a lot of visiting artists at the Pizza Express Jazz Club, particularly during the ReVoice! vocal festival Georgia curates there. At Ronnie’s I tend to play the opening support set either with singers, sax players or piano trio. The repertoire and lineups vary. It keeps you on your toes. You’re a tutor for the Jazz Degree at Middlesex University, so I would like to talk about Jazz education. 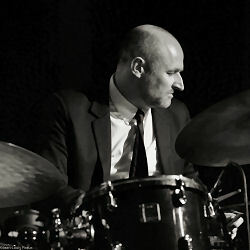 Blunt question: what makes a good jazz drummer? Listening. That’s top of my list! You need to know the melody and the form of the tune that you are playing and that will help you make good decisions. An ability to create intensity, groove, react to subtle nuances and changes of gear in the music and respond to dynamic changes. 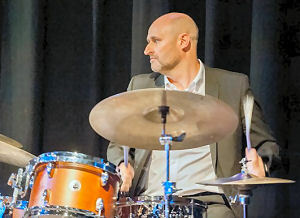 A good jazz drummer can weave a rhythmic storyline through the music that both relaxes the band and inspires them to play at their best. An empathy with and respect for the musicians you’re playing with helps a great deal. I think one of the challenges is that in order to get good at your instrument you have to isolate yourself in a room for years on end practising and then suddenly you’re expected to cooperate at a really sophisticated level with other people. I did a lot of learning by playing in public on gigs. That’s not a path I recommend necessarily but I did learn how to play WITH people and not AT people. That’s an important distinction and one I work on with my students. 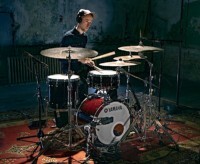 At Middlesex I often ask drummers to bring a rhythm section to their lessons. I can then see how they actually play with other musicians and explore the choices they make and examine why they are making them. It’s a fascinating process. To get up on a stage and perform, you have to have a personality, confidence and an ego. If you don’t, you’re in trouble. But if you bring too much, you’re also in trouble and you’re not going to be very popular on the bandstand. Jazz is improvisational music so the ‘baton’ is constantly being passed around the band. The skill is knowing when to engage your ego and when to withdraw it. It takes a lot of time to work that out. The balance is constantly shifting which is one of the reasons the music is interesting to play and why so many musicians gravitate towards it. 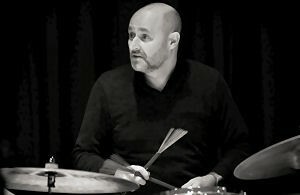 Jazz drummers of yesterday vs. today? That’s a very interesting question. There is a theory that there is slightly less individuality today because people are going into educational institutions to learn how to play the music. As I mentioned that’s something I didn’t do, so it’s quite ironic that I end up teaching in one. I’ve heard musicians talking about a lack of personality and individuality in young players. The giants of jazz music all had very distinct styles and personalities that’s for sure. For example there is only one Roy Haynes! When I was starting out there were very specific characters playing the drums in London. They had their own thing and nobody else sounded like them. Bryan Spring is a good example of that, his style is unique. The argument goes that the players coming out of the colleges get their information from the same source, so there is a kind of stylistic uniformity. There may be some truth in this, but the internet has revolutionised learning opportunities. 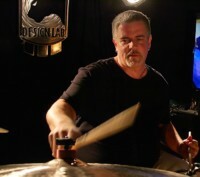 Drummers today have unprecedented access to information, techniques, video footage of the greats etc. You would think this would create a diversity of player styles not narrow it down. You only have to listen to Mark Guiliana’s amazing playing, or Ari Hoenig, to realise todays drummers are pushing the boundaries of the instrument and are brimming with originality. Do you think it was easier to get into the business back then? There were far fewer jazz musicians in London when I started out in 1990 and as a result a lot more gigs to go round, even for a beginner like me. The young players I see today are all really impressive. Technically they’re strong, they have a huge vocabulary, their time is great – they can all play at a high level at a young age. But I worry whether there are enough outlets for all this talent. The opportunities to play live are so limited. There is little sign of that changing any time soon and the number of musicians grows year on year. That is a bit of a problem. Nowadays you have to be a fully formed, happening player to get a small gig that pays peanuts. It’s not really a career at that point. You have to find other ways to make it financially viable to live in London. For me that’s teaching. When I started, teaching was a bit of a badge of failure. I remember my contemporaries, when they heard I was teaching, said: “Oh really? Haven’t you got enough gigs?”. Now, they’re all teaching. For me teaching has been a life line. You can’t rely on gigs, they are far too erratic. Do you have any career advice for up and coming players today then? If you’re determined, it will happen. It’s definitely a marathon, not a sprint. Just keep at it. If you stick around long enough, if you stay positive, turn up on time, if you have some social skills, if you work all of that out, (plus a bit of luck!) opportunities will come your way. It’s just about being ready for the opportunity and not getting jaded and cynical while you’re waiting. When that opportunity comes, react with as much energy and positivity as you can muster – people respond well to that. There will be dead years and good years. Early on I was always under the impression that it was a one-way upward curve and it was a frightening realisation when it started going the other way! But if you can survive the knock backs and disappointments and remain in love with your instrument you’ll be OK. A lot of people get themselves into this very negative state of mind: “I can’t do this or that”, “I should be able to do this” – never mind all that, ask yourself what you’re good at. If you start there all the negative stuff tends to get dealt with quietly in the background anyway. If you only think about what you can’t do you can push yourself into a state of paralysis. You persuade yourself you’re not worthy and you loose your mojo which can be very difficult to get back. What is your approach to practice; what do you recommend to your students? My practice is generally driven by learning music now. There are pros and cons to that but I prefer a musical context when practising. Something will crop up in the music that exposes a technical weakness and you just jump on that and try to deal with it. I also love getting together with friends to work on stuff. I’ve learned a huge amount from duo workouts with bassist Laurence Cottle, saxophonist Mornington Lockett and drummer Ian Thomas. They are all fantastic players and it’s great working on your craft with people of that calibre. Practicing on your own can be a lonely pursuit and you need a lot of focus and discipline to keep it happening, so I think you need to find reasons to practise and set yourself achievable goals. Jojo Mayer’s DVDs are just fantastic. The thing I love about him is that he’s interested about the body and the biomechanics of drumming. What happens with your body when you hit a full stroke or when you flat foot your bass drum pedal – that’s fascinating! Any drummer playing any kind of music will get something out of that. I was doing a week of gigs at Ronnie’s in the mid 90s playing opposite John Riley. At the end of the week he kindly gave me his book ‘The Art of Bop Drumming’ – I’m sure you know it. [laughs]. I think it a really special book and I’ve been working on it every since. I really like his concept of interdependence (rather than independence) and I use that book as a basis of my teaching at Middlesex. One thing I do warn my students is that it’s possible to over-practise and fall out of love with the instrument. Whatever made you pick up a pair of sticks and hit a drum, that child-like state, the innocent joy of banging on a drum – that’s who you are as a drummer. If you mess with that you’re in trouble but if you nurture it, it will see you through any problems. Driving yourself too hard can make the instrument an obstacle, the enemy even. That’s really bad news. Over the years I’ve met a couple of guys who ended up in that situation because they were trying too hard. You have to stay in love with the instrument! If that means stopping playing it for a period, then stop. After so many years successful in the business, do you still have something like a dream gig? If you’re looking for that ‘dream gig’ you’re not paying attention to what’s actually happening. The dream is the process itself. I’ve never aspired to a dream gig, I just want to work. I’m proud to have sustained a career for the last 25 years on the London jazz scene. To my mind it’s a big deal if you can work as a musician, hats off to you, because it’s tough! What we do is a learning curve – sometimes very painful, often badly paid and riddled with insecurity. Don’t worry about chasing the ‘dream gig’: just enjoy the fact that you’re doing it at whatever level, in whatever style of music, on the instrument you love. That’s incredible! What an important note to leave on! Thank you very much for your time Dave!